Hi, I incorrectly named my free wordpress site christinemooresoprano.wordpress.com instead of christinemoorevoicelessons.wordpress.com. Aside from recreating it in a new free domain, is there a way to transfer what I have done to the new domain? thanks in advance. The blog I need help with is christinemooresoprano.wordpress.com. Aside from recreating it in a new free domain, is there a way to transfer what I have done to the new domain? thanks in advance. 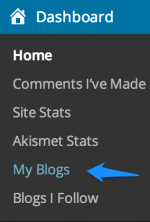 Use http://en.support.wordpress.com/changing-blog-address/ to do that. The topic ‘Changing your Domain name without having to recreate content’ is closed to new replies.